The Lost Colony is one of our nation’s oldest and most fascinating mysteries. Long after its disappearance, groups of dedicated researchers are still pursuing the facts. It’s a conversation that can only happen in North Carolina. You’re discussing the merits of various barbecue institutions around the state when the talk shifts abruptly, pointedly in a different direction. “But anyway, the Lost Colony — have you found them?” Phil Evans jokes. Evans is the president of the First Colony Foundation. The failed Roanoke settlement is his wheelhouse. Whole-hog barbecue is mine. My appetite still whet for answers — years after my fourth-grade lessons about Virginia Dare and the others — I call Evans with questions regarding every North Carolinian’s favorite history subject. “Aw man, I was hoping you’d tell me that you did,” I retort. What we do know is this: After chartering two voyages in 1584 and 1585 to the Outer Banks, Sir Walter Raleigh sought to establish the first permanent English colony in the New World in 1587. Raleigh sent 117 men, women, and children on an expedition charged by explorer John White. Initially destined for Chesapeake Bay, the settlers wound up on Roanoke Island. Six weeks later, White departed to get more supplies and reinforcements from England. When he returned three years later, everyone was gone. The word “CROATOAN” had been carved into one of the palisade’s entrance posts, and the letters “CRO” were etched into a tree. Before he left for England in 1587, White told the colonists to mark if they decided to head south to join the Croatoan Indians. Neither the post nor the tree was marked with a Maltese cross, which the colonists were told to use if they had left in distress. “Though it grieved me much to see my goods spoiled, yet on the other hand I was deeply joyful for the certain token of their safe arrival at Croatoan …” White wrote in a letter to Queen Elizabeth I’s court historian. He tried to venture south to check on them, but storms derailed his plans, requiring him to return to England without actually confirming their whereabouts. The uncertainty that has shrouded the colony’s disappearance has been stirring the imaginations of folks ever since. However, for those who are a part of the First Colony Foundation and the Croatoan Archaeological Society, two independent teams that are digging into the colonists’ disappearance, the story is anything but simple. Over the years, research has often fueled more questions than answers, but technological advancements and surprising findings in recent years have brought us more clues than ever. On John White’s 1586 map of the North Carolina coast, the island identified as “Croatoan” includes the southern part of Hatteras Island and a portion of Ocracoke Island. Since the 1990s, a flurry of excitement has centered around Cape Creek in Buxton, a hotbed for archaeological evidence pointing to an Elizabethan presence. Maggie Dawson and her husband, Scott, founded Croatoan Archaeological Society (CAS) in 2009. Maggie is originally from Tennessee, but Scott grew up on Hatteras Island. The desire to know what happened to the Lost Colony is “in his blood.” Maggie tempers his excitement over new evidence by playing devil’s advocate. 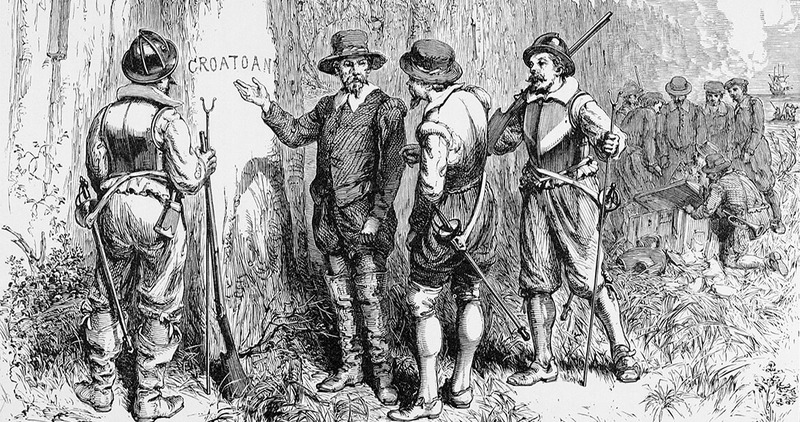 The pair might sometimes disagree about minutia, but members of CAS — local experts, volunteers, and researchers and archaeologists from the University of Bristol — all share one basic theory: The colonists absolutely did go to Croatoan, just like they said they would in their agreement with John White. Theories that have been produced in the centuries following 1590 have ranged from sensible to out-of-this-world. Some think disease wiped the colony out, while others believe it met a violent end in a bloody battle. The settlers were left a boat. Did they try to sail home and fail? Did some venture out to Chesapeake, where they were initially supposed to go? And according to some speculators, you just can’t rule out alien abduction. The possibilities are tantalizing enough that the creators of American Horror Story fictionalized the real-life mystery in the show’s sixth season. But currently, the most popular theory is that at least part of the colony assimilated with local Native American tribes. Excavations held at Cape Creek, Fort Raleigh, and elsewhere have revealed that both Native American and European goods are often comingled in ground layers dating back to the 1500s. While settlers and natives frequently traded goods with each other, certain objects that have been uncovered by various teams at Cape Creek were likely too precious for colonists to give up. Artifacts of particular interest include a gunlock, sword hilt, and a slate and pencil set. The slate and pencil are significant because so few people were literate and the Croatoans didn’t have a formal writing system. They help solidify the theory that once the colonists made it to Croatoan, they stuck around for a while. Weaponry was valuable and commonly passed down from generation to generation in a family, she says. At one of the First Colony Foundation’s excavation sites, seemingly mundane objects — as opposed to heirloom artifacts — bear some of the greatest importance to the group’s research. “Treasure hunters might like really nice stuff that would sell at a New York auction house, but historians and archaeologists are looking for evidence of human activity in a time period,” Evans says. By the time North Carolina’s first documented permanent settler Nathaniel Batts arrived in 1655, the ware appears to have lost popularity among established settlements, such as Virginia’s Jamestown. Used every day to prepare and store food, Surrey-Hampshire Border ware vessels were subject to breakage and would rarely survive many years of usage, Evans says. Native Americans didn’t typically seek European cooking and storage pots in trade because they had their own vessels for these purposes. So how did this relatively antiquated type of ceramic end up so far inland, away from Roanoke Island? Up until five years ago, most of the foundation’s work was concentrated to Fort Raleigh on Roanoke Island. But when a member of the group was working with London’s British Museum to reexamine a map that John White had drawn, an unexpected but pivotal clue revealed itself in 2012. New imaging techniques showed that the map contained hidden markings that could indicate the presence of — or at least the English’s interest in — an inland fort where colonists could resettle after leaving the coast. A patch on the map covers an X shape that prompted the foundation to reexamine previous archaeological findings at — you guessed it — Site X. “The ceramic evidence and historical evidence are agreeing [with] each other,” Evans says. While the new lead complicates an already dizzying patchwork of information that exists about the Lost Colony, there is room for multiple theories to be correct. Unless someone uncovers a mass grave containing the bodies of all 117 settlers, experts from both camps agree that the likelihood of all colonists meeting the same fate is small. How close we are to an answer about the whereabouts of the Lost Colony could be dependent on the discovery of an English structure, whether that is a fort or house, at Site X, Hatteras Island, or elsewhere. This spring, the First Colony Foundation plans to revisit evidence of a slot trench that was discovered at Fort Raleigh in 2009. Deetz says it hopes to determine the age of the trench’s sediment through new technology. In colonial times, palisade walls were installed by digging slot trenches, and the presence of a slot trench could possibly indicate the existence of a structure. There’s always more work to do. As CAS and the foundation continue to dig, catalog, and analyze, the possibility of another breakthrough hangs in the air. “There’s always going to be an element of mystery — unless we can time travel,” Dawson says. Crazier things have happened. Some 426 years ago, 117 people disappeared with few clues. In 2017, we’re still trying to find them. Think you can help solve the mystery? Sleuth around one of these Outer Banks spots. Learn about the various English expeditions to Roanoke Island and the cultural heritage of Native Americans, European Americans, and African Americans who have called the area home over the centuries. The site boasts two walking trails through the maritime forest. Get an up-close look at European and Native American artifacts that the Croatoan Archaeological Society has unearthed in its excavations. Imaging what life would’ve been like on Roanoke Island during the 1585 expedition becomes a little easier thanks to this historical attraction. Glimpse the “Settlement Site” and “American Indian Town” and explore a recreation of a 16th-century sailing vessel. The United States’ longest continuously running outdoor drama celebrated its 80th anniversary in 2017 and brings aspects of our nation’s oldest mystery to life.